Reef Shot is an underwater adventure game that takes the player on an unusual voyage to the Pacific and gives him an opportunity to explore the world of marine life and discover sunken Mayan ruins and the end of the world prophecy. The player starts a photo-diving expedition along the coast of Robinson Crusoe Island, which becomes a mysterious underwater adventure. The game combines a navigation system in 3D space and mechanics of taking photos in realistic underwater scenery. It offers an engaging experience based on various tasks and ocean environment, supported by high quality soundtrack. According to an old legend, in the year 1560 conquistadors reached the ‘Gold City’, El Dorado, but it was already abandoned. The natives had left traces suggesting they constructed a huge cargo fleet and fled with their treasures and a secret – a prophecy regarding the future of the world. A company of Spanish soldiers led by an ambitious commander Lope de Aguirre gave chase, as he believed that learning the prophecy would give him power he so desired. He reached the new El Dorado but a volcano thwarted his plans. The truth about the prophecy has been lost. 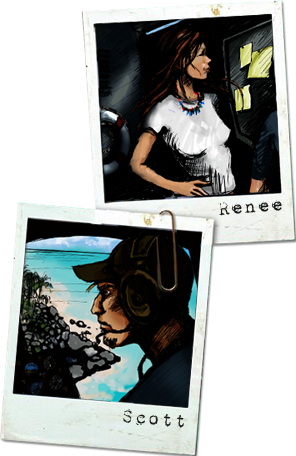 In 2012 Scott and Renee, diving explorers and photographers, are hired to explore the vicinity of a Pacific island. While diving they discover relics of an ancient South American civilization. They know that they stand a chance of making a great discovery and follow the lead. The artifacts they find in the sunken ruins show them the way to the message left by the people of El Dorado.